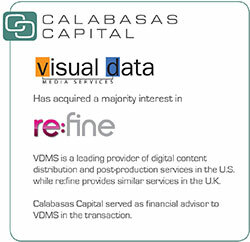 Calabasas Capital is pleased to announce that its client Visual Data Media Services has completed the acquisition of re:fine. Burbank-based Visual Data Media Services, Inc. provides digital content management, distribution, storage and post-production services to worldwide media outlets, including domestic syndication, network broadcast, international distribution, VOD, and SVOD for studios, distributors and major platforms and has been growing rapidly over the past several years. London-based re:fine specializes in content processing and digital-media. The deal will provide each company access to the other’s markets, technologies and infrastructure. Both re:fine and Visual Data have established successful business models, client bases and third-party accreditations as vendors for content networks and broadcasters, including Netflix, iTunes, Google and the UK’s ITV. Securities offered through Fallbrook Capital Securities Corp, member FINRA - SIPC. Calabasas Capital | All rights reserved. The information contained herein is believed to be reliable, but is not guaranteed as to its accuracy or completeness. This website is provided solely for your information and convenience. This material does not constitute an offer to sell or a solicitation of an offer to buy any security. An offer can only be made by a prospectus that contains more complete information on risks, management fees and other expenses. In order to fully understand all of the implications and risks of investing, investors should carefully read a prospectus before investing.